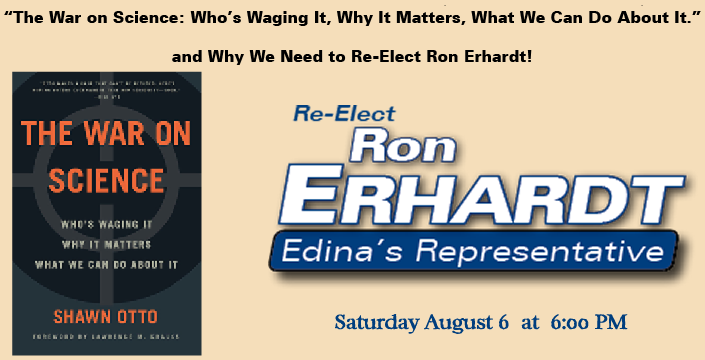 Please join us to hear award-winning author Shawn Otto, organizer of the US Presidential Science Debates, talk about his new book, “The War on Science: Who’s Waging It, Why It Matters, What We Can Do About It” and Why We Need to Re-Elect Ron Erhardt! Representative Ron Erhardt, a decorated combat veteran, has prioritized science and technology in his policy decisions throughout his career—from stem cell research to environmental legislation. This work has earned him endorsements from Conservation Minnesota, The Sierra Club, and Planned Parenthood. Join in our efforts to return him to Saint Paul this fall. We need his legendary fire to defeat the Republican Party’s platform, which would defund Planned Parenthood, reject stem cell research, and deny advances that would address any type of climate change. Suggested donations of $50 and up. Contribution limits are $1000 per individual. accountable when it comes to scientific standards. Due to legal requirements, No PAC or Lobbyist donations — although spouses of lobbyists or other family members may donate. Your payment and financial information will be securely collected at the PayPal website whether you are a member or not. You may donate up to $1,000 individual or $2,000 couple, total, during the 2015-2016 election cycle. We are required by law to record your Occupation and Employer in order to accept your donation. If you are not employed, please enter some descriptive term(s) for Employer and Occupation, such as ‘N/A’, ‘retired’, ‘homemaker’. If you list “Self Employed” please describe what you do. When Donating as a Couple, we are required to get both names, both occupations, and both employers. You can do that with a “/” to separate. If you have already donated your 2015-2016 maximum to the Erhardt Volunteer Committee, please call or email the Coordinator [below] for assistance with a reservation. You will receive a receipt for your donation toward a reservation. Tickets will be distributed later by the coordinator. Thank you. It will be a wonderful, unique evening. Need to talk to someone from the campaign?